Capilano Suspension Bridge | British Columbia ROCKS! 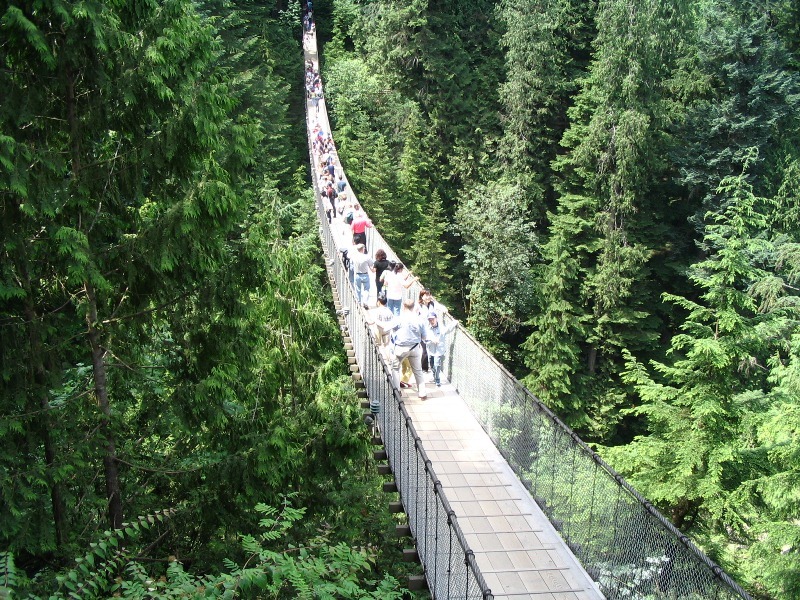 Located in North Vancouver, the Capilano Suspension Bridge has actually been around for a very long time. (From Wikipedia) The bridge was originally built in 1889 by George Grant Mackay, a Scottish civil engineer and park commissioner for Vancouver. It was originally made of hemp ropes with a deck of cedar planks, and was replaced with a wire cable bridge in 1903. In 1910 Edward Mahon purchased the Capilano Suspension Bridge. “Mac” MacEachran purchased the Bridge from Mahon in 1935 and invited local natives to place their totem poles in the park, adding a native theme. In 1945, he sold the bridge to Henri Aubeneau. The park was sold to Nancy Stibbard, the current owner, in 1983. This attraction is truly worth visiting. But wait! There is much more to do than walk across an exciting suspension bridge! The other side also boasts walkways suspended from old growth Douglas Fir trees and a supported walk that takes you out over a cliff edge. Check it out, you will not be disappointed! This entry was posted in British Columbia and tagged Bridge, Capilano Suspension Bridge, Douglas Fir, North Vancouver, Suspension bridge, Technology, Vancouver, Wikipedia. Bookmark the permalink.